It’s another hummingbird bakery recipe, and it lives up to their reputation – pretty and delicious! These are actually mini cupcakes but I’m pretty sure you could make full size ones without getting hammered, there’s not that much alcohol in them (provided you stick to the recipe…). But the mini ones are super cute and perfect for cocktail parties, which is what I made them for – classy, right? I try. If you want to make mini ones, you’ll need special mini muffin tins- you can’t just put mini muffin cases in a normal-sized muffin tin because they’ll spread everywhere and go really flat. So if you don’t have one, just go with normal sized, and risk the wraths of the Hummingbird Bakery gods. 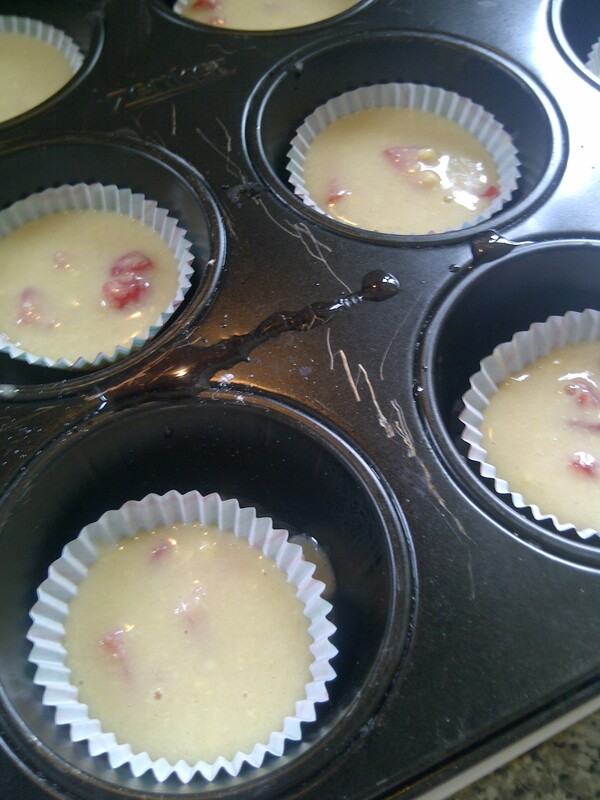 Preheat the oven to 170°C (gas mark 3), and fill a muffin tin with cases. I made about 24 mini muffins, so use your own judgement. Bring the rum and 30g of the caster sugar to the boil, reduce it by about half, then take it off the heat and let it cool slightly. Hull and chop the strawberries and soak them in the rum for 30-40 minutes. If you’ve got an electric mixer or handheld blender of some description, blend together the butter, flour, remaining sugar, baking powder and salt. If you’re doing it by hand, cream together the butter and sugar first, then add the other ingredients (makes it a bit easier!). The mixture should look like breadcrumbs at this point. In a jug, whisk together the egg, milk and vanilla essence. Whisk it into the flour and butter mixture, keeping it churning constantly. Make sure it’s all fully mixed together. Drain the strawberries from the rum mixture (but SAVE THE RUM – for the love of god don’t throw it away!). 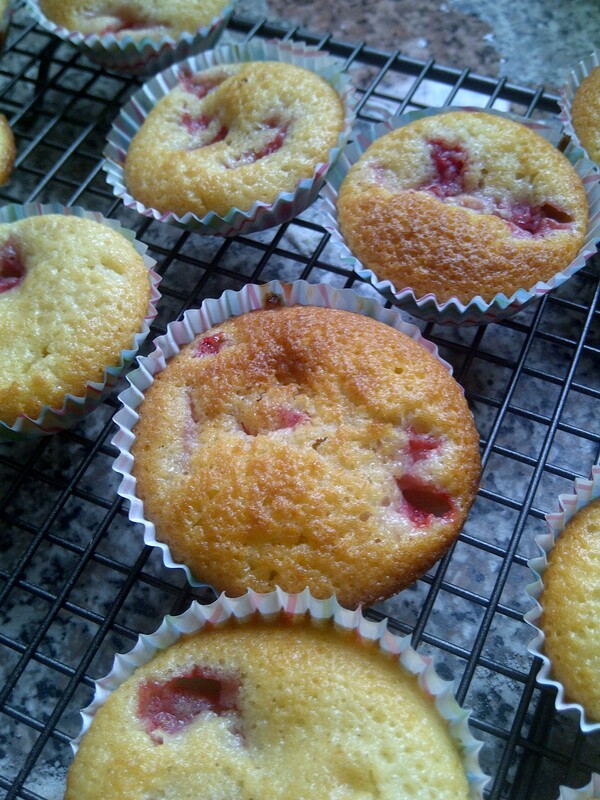 Pop a couple of bits of strawberry in the bottom of each muffin case. Obviously a bit more if you’re making full size cupcakes. Spoon the batter over the top so the cases are about two-thirds full. 6. Bake for 12-15 minutes/until golden brown – you know the score. Whilst they’re still warm, spoon half a teaspoon of the rum reduction over each cake (don’t use all the rum!) and leave it to soak, and leave the cake to cool. 7. In a mixing bowl, beat together the butter, icing sugar and lime zest until it looks like fine breadcrumbs. Mix together the milk and 4 teaspoons of rum reduction, then pour this into the butter/icing sugar concoction, mixing slowly. Then beat it all together a bit more vigorously until you have a lovely fluffy frosting. 8. Frost the cakes! Then pop some of the sliced strawberries on top for decoration. Beautiful! I was really pleased with this recipe, my housemates loved them too! It’s difficult to go wrong with a hummingbird recipe really. 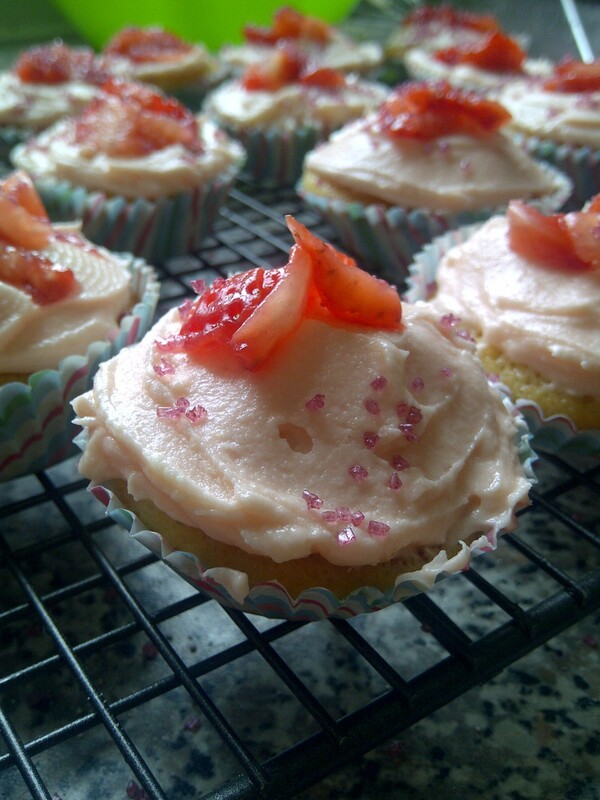 Obviously you can replace the strawberries with other fruit, or change the cocktail altogether – my housemate made lime mojito cupcakes from the same recipe book, and they were also delicious! ← Coffee and chocolate macarons!